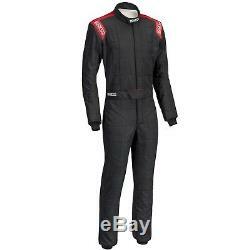 Sparco Conquest R506 Race Rally Suit FIA Approved Overalls 2 Layer Nomex. FIA approved 2 layer Nomex® race suit, perfect for clubman competition. Constructed using a traditional box quilting stitching and features traditional Sparco epaulette design in contrasting colours, concealed side pockets, Velcro® belt closure and elasticated wrist and ankle closure. The item "Sparco Conquest R506 Race Rally Suit FIA Approved Overalls 2 Layer Nomex 52" is in sale since Friday, November 23, 2018. This item is in the category "Vehicle Parts & Accessories\Clothing, Helmets & Protection\Car & Kart Racewear\Race Suits".